CBS took households and viewers on the strength of CSI (the night’s most watched program) and Without a Trace, while ABC managed to just barely take first place among adults 18-49 thanks to that demo’s most watched program last night Grey’s Anatomy and a solid performance by Lost. 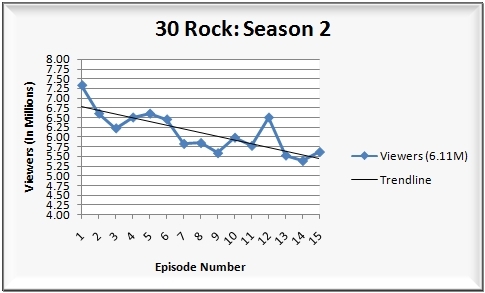 Continue reading for the night’s complete ratings, plus since two shows had their season finales last night (NBC comedies Scrubs and 30 Rock) I’ve added season ratings charts. Check it all out after the jump. CBS finished in first place for the evening with a 9.5/16 household rating/share and 15.03 million viewers, but was second among adults 18-49 with a 4.3/12 rating/share. 8:00 p.m.: Survivor: Micronesia (7.7/13 HH rating/share, 11.98M viewers, 4.1/12 A18-49 rating/share). 9:00 p.m.: CSI: Crime Scene Investigation (11.2/17 HH rating/share, 17.82M viewers, 4.9/13 A18-49 rating/share). 10:00 p.m.: Without A Trace (9.7/16 HH rating/share, 14.60M viewers, 3.8/10 A18-49 rating/share). ABC followed in second place for the evening with a 7.7/13 household rating/share and 11.62 million viewers, but managed a stronger first place finish among adults 18-49 with a 4.4/12 rating/share among adults 18-49. 8:00 p.m.: Ugly Betty (5.6/9 HH rating/share, 7.99M viewers, 2.4/7 A18-49 rating/share). 9:00 p.m.: Grey’s Anatomy (10.4/16 HH rating/share, 15.60M viewers, 6.1/16 A18-49 rating/share). 10:00 (10:02) p.m.: Lost (7.0/12 HH rating/share, 11.28M viewers, 4.9/13 A18-49 rating/share). FOX finished in a tie for third place for the evening with a 4.4/7 household rating/share, was alone in third among viewers with 6.98 million viewers, but fell to fourth place among adults 18-49 with a 2.0/5 rating/share. 8:00 p.m.: Are You Smarter Than a 5th Grader? (4.8/8 HH rating/share, 7.73M viewers, 1.9/6 A18-49 rating/share). 9:00 p.m.: Don’t Forget the Lyrics! (3.9/6 HH rating/share, 6.22M viewers, 2.0/5 A18-49 rating/share). NBC followed in a tie for third place for the evening with a 4.4/7 household rating/share, was fourth among viewers with 6.58 million viewers, but managed a third place finish among adults 18-49 with a 2.8/8 rating/share. 8:00 p.m.: My Name Is Earl (4.1/7 HH rating/share, 6.08M viewers, 2.6/8 A18-49 rating/share). 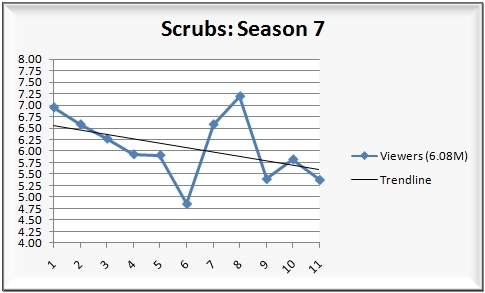 8:30 p.m.: The seventh season finale of Scrubs (3.7/6 HH rating/share, 5.37M viewers, 2.5/7 A18-49 rating/share). Note that this will also be the last original airing of the show on NBC. It’s scheduled to move over to rival network ABC this fall. 9:00 p.m.: The Office (4.7/7 HH rating/share, 7.22M viewers, 3.6/9 A18-49 rating/share). 9:30 (9:31) p.m.: 30 Rock (3.6/6 HH rating/share, 5.61M viewers, 2.1/5 A18-49 rating/share). 10:00 (10:01) p.m.: E.R. (5.3/9 HH rating/share, 7.61M viewers, 2.9/8 A18-49 rating/share). The CW finished in fifth place for the evening with a 2.1/3 household rating/share, 3.25 million viewers and a 1.3/4 rating/share among adults 18-49. 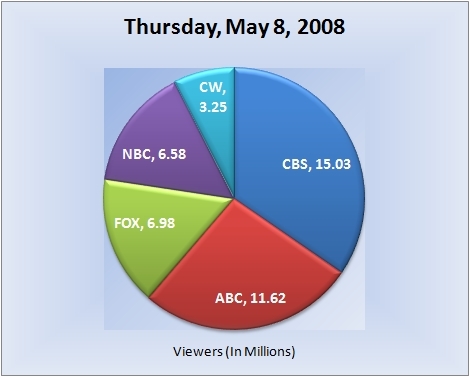 8:00 p.m.: Smallville (2.5/4 HH rating/share, 3.96M viewers, 1.5/5 A18-49 rating/share). 9:00 p.m.: Supernatural (1.7/3 HH rating/share, 2.53M viewers, 1.0/3 A18-49 rating/share). Note: Network average numbers from the week prior are based on fast national data. Comparison’s from the week prior (or episode-to-episode, etc.) on specific shows are based on final national data. Ratings for the current day are based on fast nationals. (Expect all three scenarios to be the case at all times, unless otherwise noted). The final rating for first-run episodes that aired this evening will be reported the following week. So for example, the final rating for tonight’s episode of “CSI: Crime Scene Investigation” will be reported in next weeks report for Thursday, May 15, 2008.